I love you. I really do. I know you said if I bake things you love it doesn’t show that. Because then you eat them. And regret it. But, I bake them because I love you. And the kids. 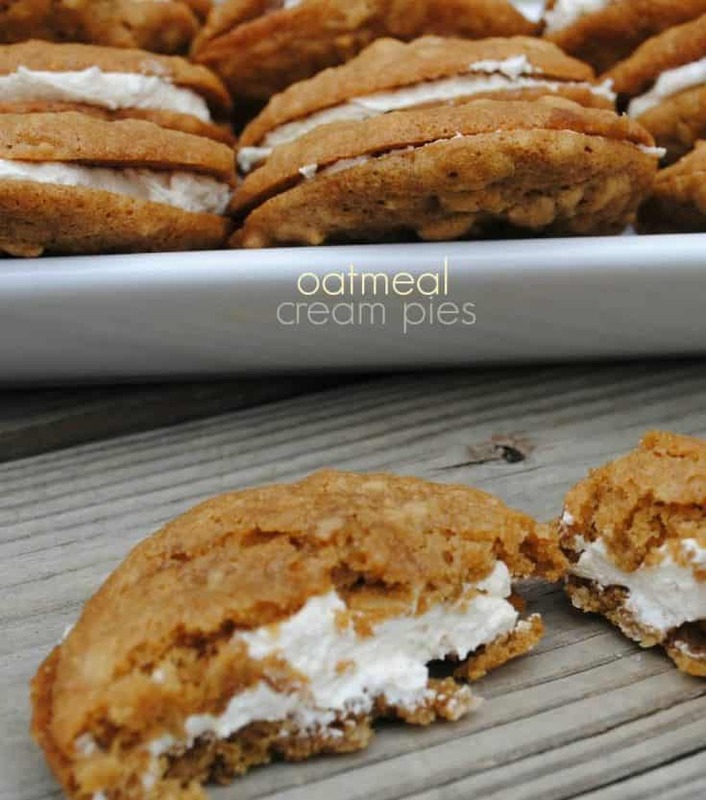 Please accept this tray of homemade oatmeal cream pies as a token of my love. Or, stay at work until we have finished eating them. I personally do not like the Little Debbie Oatmeal Cream Pies. I do love the Nutty Bars and Starcrunch…which I am going to attempt to recreate here soon! But, there are lots of recipes online floating around to make the creme pies. So, I did. And I like them. A lot!! The recipe made 24 cream pies, so I had to freeze them so that the kids would have them for lunches the rest of the week. Then this morning I ate one frozen. It was still really good. Sorry kids, but I’m doing this for your dad. In large bowl, beat margarine, brown sugar, granulated sugar, molasses, vanilla and eggs. Add flour, salt, baking soda and cinnamon. Mix in the oats. Drop by ONE tablespoon onto a parchment lined cookie sheet. Bake 8-10 minutes in a 350 degree oven, until just starting to brown around the edges. DON’T OVERCOOK! After cookies have cooled, combine hot water with salt and mix until salt is dissolved. In large bowl, beat marshmallow fluff with Crisco, powdered sugar and vanilla. Beat on high until fluffy. Add in salt water and mix until well combined. Spread filling on one cookie and press second cookie on top. Enjoy! I am so glad you linked up this week. These look just like those Little Debbie snack cakes! Ty- I went to Jungle Jims today and found the elusive wafer sheet (in the Germany section). This is what has been holding me back….Nutty bars tomorrow, I’ll let you know how they turn out. I do love the little debbie version but I’m sure these are a million times better!!!! Can’t wait to try! I have been wanting to try a homemade version of these forever. Yours look soooo yummy with all that cream filling! Oooo these look so good. Creamy!! These look amazing. I do a new cookie every Monday on my blog and think I am going to feature these today. Excellent post. So neat, those remind me of those Little Debbie cakes, though I’m sure that yours are even better. You are cracking me up with your comments. I think I might be channeling you with my thoughts. I just discovered your blog this evening but will be checking things out and trying new recipes. Thanks! What??? OMG, I have to make these. Love, love, love!! Thank you! made my third batch yesterday, they are sooooooo good, better than store boughten & you know whats in them also, no artifical junk. These really do look good. My kids love most of the little debbie items. I will have to give this recipe a try. Thanks for sharing. Help! The flavor of these is FABULOUS! But mine are really, really fragile- can’t even spread the filling without tearing them. Any suggestions? 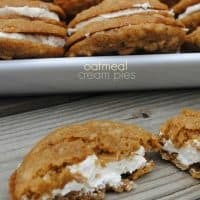 I have been looking for a homemade version of these for years! The flavor is so good my fam says they are better than Little Debbies. 🙂 I anxiously await your reply! Hi Dawn, they might possibly be a tad undercooked? You can do one of two things. Refrigerate them and hope that helps with spreading on the filling. Or, put the filling in a ziploc bag, snip off the end, then pipe it on (so you don’t have to spread it). These are normally moist, but not fragile. I’m glad they taste good though!!! Could the molasses be replaced with raw honey? Why can’t butter be substituted for the margarine? Just curious. I have been DYING to make these and I finally did! Mine tuned out much lighter in color and fluffier than yours. What could I have done? (I did use the butter flavored crisco.) It’s no big deal though because they taste WONDERFUL!!! Just wondering. 🙂 Thanks!! First, I’m glad you enjoyed them! As for color and texture it could be a couple things…brand of brown sugar and molasses could change the color…some vary in depths! As for texture, it could be how long you beat the batter, and the freshness of baking soda. So glad you love them! I cannot eat margarine due to the fact that it is made with soy. I cannot use Crisco, either. What will butter do to the recipe?? Thanks…I’d love to try these! Butter will work, the cookie might have a little bit of a different texture (may end up flatter). Still will taste great though. I never buy margarine and was curious why you shouldn’t use Butter ??? What if we dont have parchment paper?! Wow these were spot on! 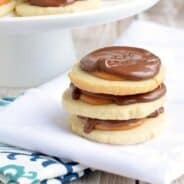 I am in the midst of baking these right now and they are absolutely perfect!! they taste exactly like the ones I remember in the cellophane packages. Thanks for your recipe and all your great work in helping me bring out the best in my kitchen for my family!! So glad to hear it!!!! Enjoy! Hello I have never heard of a Jar of marshmallow fluff…where can I find it? I am in Canada and we don’t have a lot of the stuff the US has is that maybe it? The marshmallow cream. Is. Much better Then then Fluff! By far! We buy the Little Debbie ones from the grocery store all of the time for my boys. I would love to make them at home and have them taste yummy! I can’t wait to try this recipe! These taste just like the real thing. Only better cause you know all the ingredients you used!!! Holy cow just finished these and they are awesome!!! Thanks for the amazing recipe!! I am making this now. I am really excited to try them. They are baking up great. I wish I didn’t have to guess the amount of powdered sugar. Thanks so much! I can’t believe how quickly you responded! I am still baking them! So, how much powdered sugar?? Can you clarify the “1½ (7oz) jars of Marshmallow Fluff” – are you saying its 7oz TOTAL or 1 7oz jar + 1/2 of another jar (so 10.5oz total). Yes, can you please clarify this? I was all set to give this a go and then saw the Crisco which is GMO soybean and I have a soy allergy. Is there a substitute for that ?? Can’t wait to make these I know they will wonderful. I would like to know if molasses can be replaced with honey or any other ingredient? 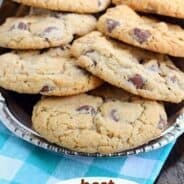 Thank you so much for posting this recipe for oatmeal creme cookies. I was wondering if you would consider making a copycat of the apple oatmeal cookies. I only ever found one box of them at the store and they were WAY better than the original ones. But now I cant find them. Anyone have any ideas? I just store them in an airtight container on the counter! I have everything together and am wondering if I can make tonight and stuff tomorrow? ??! My cream came out runny…should I beat it longer..? Oh and there is no Crisco where I live (europe) so I used reg butter. Besides that these are awesome! Good ol’ American treat! Hmmm, I’m not sure why it would be runny, maybe too much water? Anyways, glad you enjoyed them. This recipe SUCKED. It spread out into one giant flat cookie? It was awful, and did not cook evenly. i love little debbie version , but i can not wait to try yours , thank you . These turned out looking like the real thing, but it not taste like an original little Debbie. In fact, the crisco taste is not good! My 9 year old called them just ok and didn’t want anymore after just 1 bite. I took a few bites and already have a stomach ache. 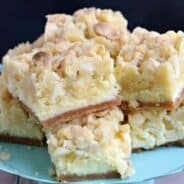 I made them exact to the recipe and if maybe I liked eating butter and sugar sandwiches, I would like this….but a definite that I won’t make them again. What can you subsitute for the butter flavored Crisco? I don’t use it because I don’t really like it.